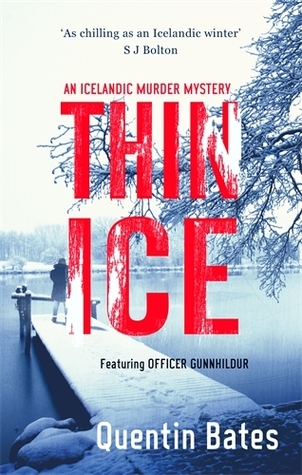 Today’s post has been written by crime author and Icelandic translator Quentin Bates as part of his Thin Ice blog tour and is a fascinating insight into the language of the Icelanders as we all love to read Nordic crime we as crime fiction fans. You can read his First Draft Q&A Here. Quentin escaped English suburbia as a teenager and found himself working in Iceland, where his gap year eventually became a gap decade, along with a new language, a new profession and a new family acquired in the process. He trained as a ship’s officer before unexpectedly side-stepping into an obscure branch of journalism and from there into fiction. 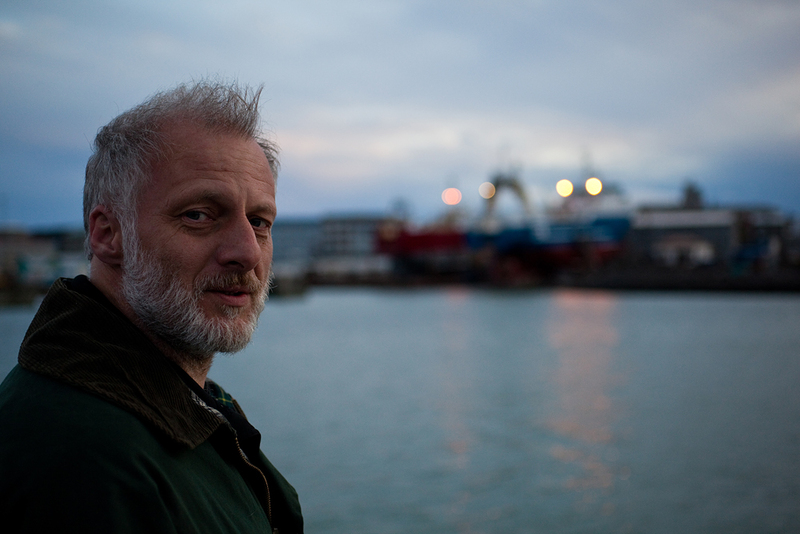 The Gunnhildur novels were born of his intimate knowledge and fondness for Iceland and its people, plus a fascination with the turmoil of the country’s recent history. He is also translating the novels of Ragnar Jónasson, Snowblind and Nightblind, into English, published by Orenda Books. There’s a problem that can’t be avoided when you set your fiction anywhere that has a language of its own and the further removed from English, the greater the problem can become. It’s the names. One criticism I see all the time is that the names in books set in Iceland are so difficult. Well, yes. They would be. I have to admit it bugs me. Icelanders aren’t called Jim and Mary. If you want fiction with easy names, then choose something that’s set in Tunbridge Wells rather than in Peru, Japan or Iceland. People in Nordic countries have names that often sound awkward to our ears, but it’s not something a writer can avoid –although it’s something that can be mitigated and I admit that I have simplified names as far as I dare without sacrificing too much reality. Icelandic has letters that only a handful of other languages use. Þ is a soft th, as in bath. Ð is more complicated and it can’t be replicated easily in the same way that Þ can be replaced with th. Ð is a hard th as in bathe, and a simple th or d don’t come close to the sound that ð has in the middle of a word or name. So I chickened out. I don’t use names that have ð in them, which rules out around a third of Icelandic names. Þórður, Auður, Guðmundur, Daði, Iðunn, Óðinn and Guðríður are all out, as are Davíð, Hreggviður and Þorgerður. I chose to just not use them rather than try to produce a clumsy equivalent that wouldn’t do justice to the rather beautiful sound these names have. Many Icelandic names are of Biblical origin; Tómas, Sara, Jakob, Jón, and many others. But it has to be faced that most names are Norse in origin and that’s just the way it is. There’s no getting around that fact Thór, Freyja and Loki are still alive and well in the names of present-day Icelanders, Norwegians and others across the Nordic region. One day while I was working on Chilled to the Bone a few years ago, one of these comments popped up. Call me cross-grained, but I decided on the spot that if there were going to be complaints about awkward names, then I’d come up with something properly awkward, a tongue-twister of a name that would at least be worthy of criticism. It was the villain in the story who was just taking shape at the time, a rawboned, vicious, filthy-tempered, old-fashioned kind of criminal and someone who deserved an old-fashioned name to go with it. So Hróbjartur Bjarnthórsson came into being. Yes, it’s a name that calls for a moment’s thought and a deep breath before you try and say it. I never expected it to stay in the manuscript, and was sure that my editor would demand that it be exchanged for something a little more easy on the tongue. But she didn’t say a word, so Hróbjartur Bjarnthórsson stayed, although like virtually every Icelander, he has a nickname, a shortened version of his name. Only his grandmother or a police officer would call him Hróbjartur. The rest of the world knows him as Baddó. What I hadn’t reckoned with was that the Gunnhildur books might one day become Audiobooks. That was when I started wondering if I hadn’t been a little rash introducing Hróbjartur Bjarnthórsson to the story. Reader Mel Hudson and I spent a good few hours going through the names in the books, both people and places, with me teaching her rudimentary Icelandic pronunciation so she could get it as right as possible. Guess what? After a couple of tries, Hróbjartur Bjarnthórsson just rolled off her tongue without missing a beat. It looks like I’d better try harder. You can find Quentin on his website, Amazon author page, and the website for the Icelandic crime festival, Iceland Noir, he organises. 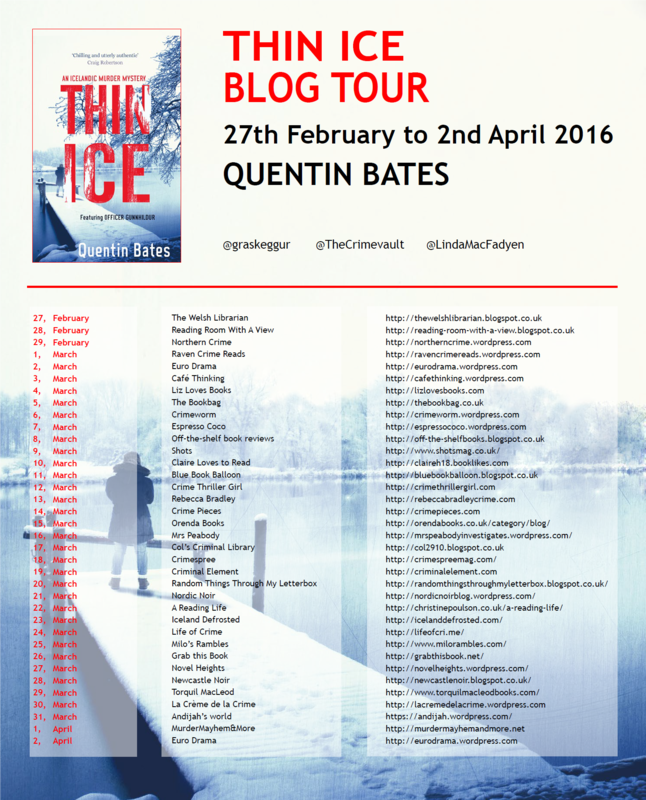 You can follow Quentin and the rest of the Thin Ice blog Tour on the below blogs. I have always been amused by the comments about finding it hard to pronounce or keep track of all those ‘foreign sounding’ names in books. I develop my own interior monologue and pronounciation while reading the book, which is probably miles away from the real thing but helps me. Until, that is, I came across a recent book translated from Japanese (a language which I actually speak) and there were about 5 names starting with M, and having another m and k in the middle somewhere, and I started muddling them up…. So there is a limit! Of course, if you see them written in Japanese Kanji, the characters are probably completely different, so it’s much easier, but translated in a Latin alphabet, it was well nigh impossible. This made me smile – I loved the long awkward name – different is good.